Following the success of his first book about a U.S. Navy flight crew’s desperate battle to survive a 1978 ditching in the icy north Pacific, Andrew Jampoler has turned to an equally exciting Navy adventure set in the desert of Ottoman Syria more than one hundred fifty years ago. Ordered to fix the exact elevation of the Dead Sea and to collect scientific specimens, the expedition was the Navy’s first and last to the storied salt lake of the Old Testament. The expedition’s leader, Lt. William Lynch, was at once a coolly scientific and a devoutly religious man who hoped to find the ruins of Sodom and Gomorrah and sustain the Book of Genesis account of the cities’ destruction. 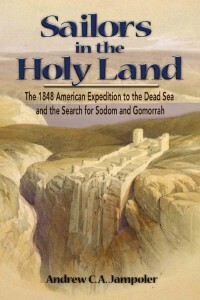 Drawing on his extensive research in Turkey, Jordan, and Israel, the author presents not only first-time details of the expedition but also sets the expedition into a colorful context of biblical story and of the great events of the mid-nineteenth century that included global epidemic disease, political revolution in Europe, the collapse of Ottoman imperial rule, and the secularization of America. He also offers a taste of Navy life at sea during a decade when sail began to give way to steam. Readers join Lynch and his men as they launch two small boats on the Sea of Galilee at Tiberias to run the Jordan rapids and then plumb the depths of the Dead Sea while members of the shore party and their Arab escorts follow along on camels and horseback. Officers and sailors alike believed that every previous expedition had been stricken by killing disease or assaulted by murderous desert tribes, but specially selected volunteers were prepared to suffer on a mission as much about religion as science. A sea story of unusual dimensions, their adventure has secured a permanent place in history thanks to Jampoler’s skillful recounting of events large and small.